As the Boulder City Council elections grow nearer, everyone has the same question on their minds; who are you voting for? As one of the thirteen candidates running for Boulder City Council, Daniel Ziskin wants you to vote for him. 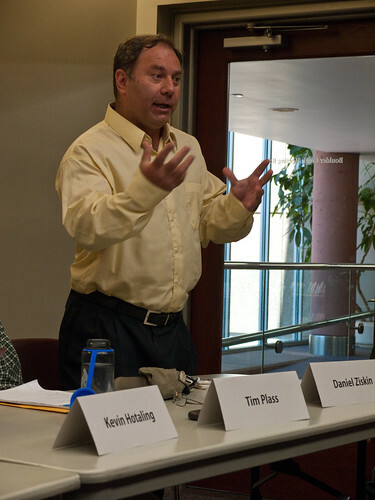 With his broad background and beliefs, Ziskin feels he’s the one right for the job. Ziskin received his PhD in physics and is now trying his hand at real estate investment and independent computer programming, after working 15 years as an earth scientist. He has held many positions on nonprofit boards, including vice president of the board of eGo Carshare, president of the board of Southern Plains Land Trust, board member of Animal Watch Colorado, Kindness Ranch Animal Sanctuary, and Service Committee of Congregation Nevei Kodesh, and former vice president and executive director of SkillShare Network. With his diverse background knowledge Ziskin believes he has the leadership qualities the council needs. “There are many forms of leadership and two stand in contrast to each other. One is to be a bold visionary with new approaches to each problem. The second style is the ability to see projects through to the end by persistent attention to details. I am skilled at both styles.” He also believes he is a team player, and that his participation will make the council run smoother, more efficiently, and will arrive at better decisions. Create a staff person within the Economic Vitality department that assists startup businesses. That office should administer a program that gives startup businesses favorable rates for facilities they may need, such as a commercial kitchen or warehouse space and access to excess supplies. The city should increase North-South mobility. The bike routes are far more conducive to East-West travel. There is no comparable bike thoroughfare like the Creek Path that allows bikers to commute easily. The city should enact the will of the voters on the issue of our power supply (2B&2C). If these ballot initiatives pass, there will be a lot of work needed by city council to ensure high quality execution of critical studies. The ballot measure on energy municipalization is predicted to be a heated topic of the election, and every candidate has differing opinions. Ziskin supports the ballot measure, and believes Boulder should have our energy generated by cleaner methods than burning coal. “Xcel is committed to the billions of dollars they’ve sunk into building coal-fired power plants. We cannot create the future we envision for ourselves with another 20-year contract with Xcel.” He wants to make a speedy transition to cleaner and healthier energy sources. Whether you agree with Ziskin’s views or not is up to you, but something all of us Boulderites can agree on is his vision for Boulder, as the best place in America to live.